it feels like time for a rainy day movie. but, alas, I have no time for one, nobody to cuddle up with while I watch one, and no interest in staying awake for a whole one. it’s all just too bad. tonight we went over to alex’s and watched cheaper by the dozen. it was an interesting mix of people there. they wanted to play a game after the movie, but I just didn’t have the energy. it sounded like unfun. here at home I can smell the posole cooking, and I know there’s herb cheese in the fridge. I want it very badly. come to think of it, I never ate dinner. just dave’s for lunch, and I wasn’t so enthusiastic about that. cow doesn’t taste as good as it used to. it makes me sad that I don’t like red meat so much anymore. 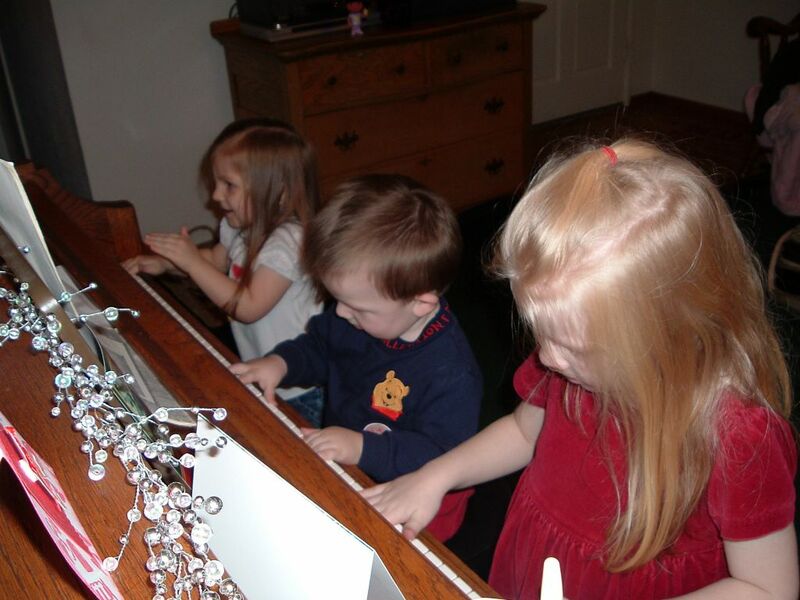 aeden (3), david (1), and amberly (4) playing the piano on christmas eve. What’s the point of having a job if you can’t be evil? Your nose looks like something that should be on some weird animal when I poke it like that. You’re gonna confuse me and I’m gonna confuse you and we’ll be cool ’cause we have a Sarah!